Initial coin offerings (ICOs) are gaining further momentum as an alternative form of crowdfunding globally. Yap Lian Seng, Managing Partner of ZICO Insights Law LLC (a member of ZICO Law) together with Senior Associate, Heng Jun Meng, share their views on the emergence of cryptocurrencies, exchanges, and ICOs, and the regulatory perspective in ASEAN. In our publication in November 2017, we noted the rising popularity of initial coin offerings (ICOs) and shared our insights1 on the regulatory stances of key jurisdictions. The ICO market remains buoyant in 2018. According to a report prepared by PwC in collaboration with the Swiss Crypto Valley Association, as at June 2018, more than USD13 billion has been raised from ICOs around the world – almost double the total amount raised in the entire 20172. Since June 2018, more than USD1 billion has been raised from ICOs launched from Singapore, which retains its status as one of the most popular jurisdictions in the world to launch ICOs3. The emergence of cryptocurrency and ICOs has not gone unnoticed in many other ASEAN countries. As though mirroring the diversity within the ASEAN region, the regulatory approach varies significantly from one ASEAN country to another. 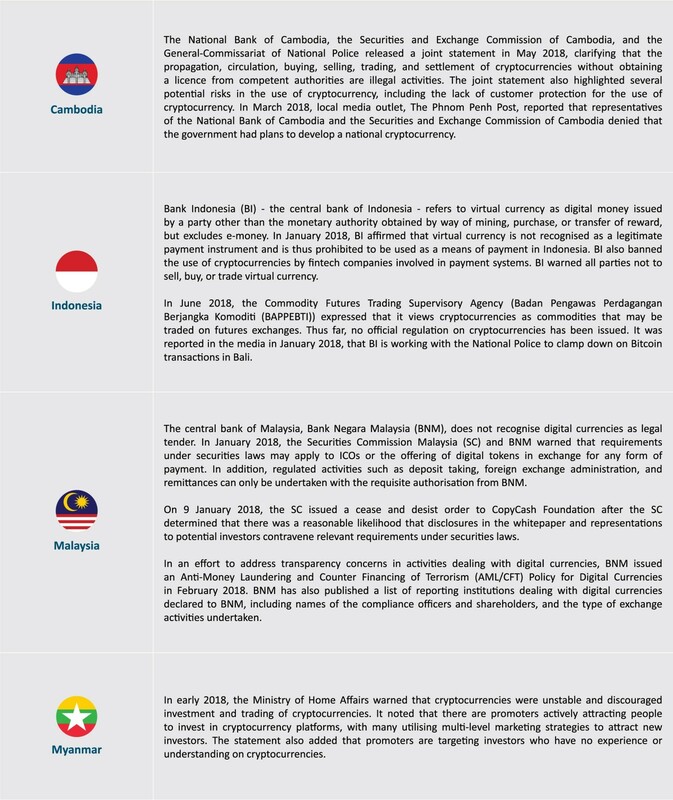 In this publication, we provide a snapshot of the regulatory environment for cryptocurrencies, ICOs, and exchanges in 94 out of 10 ASEAN countries. 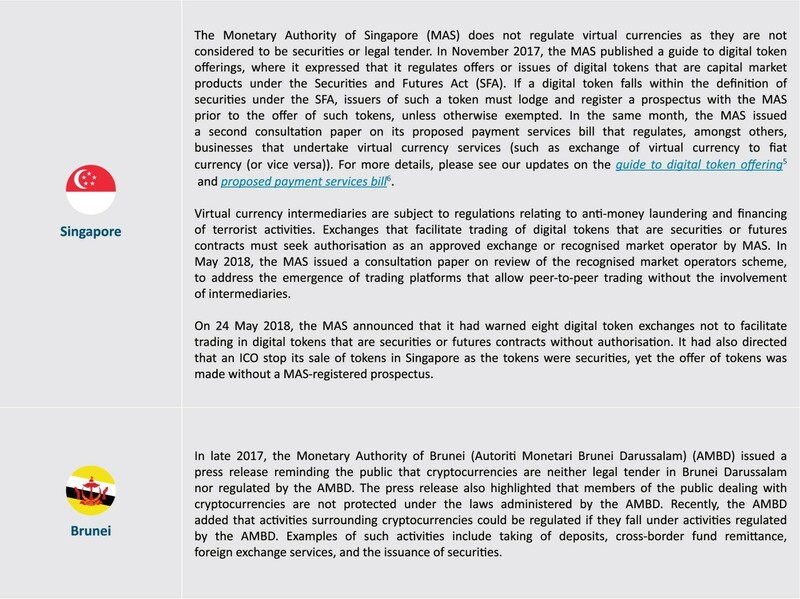 As can be observed from the above summaries, each ASEAN country takes a different regulatory approach towards activities relating to cryptocurrencies, exchanges, and ICOs. Notably, Thailand and Philippines have taken the initiative to put in place laws applying specifically to ICOs. 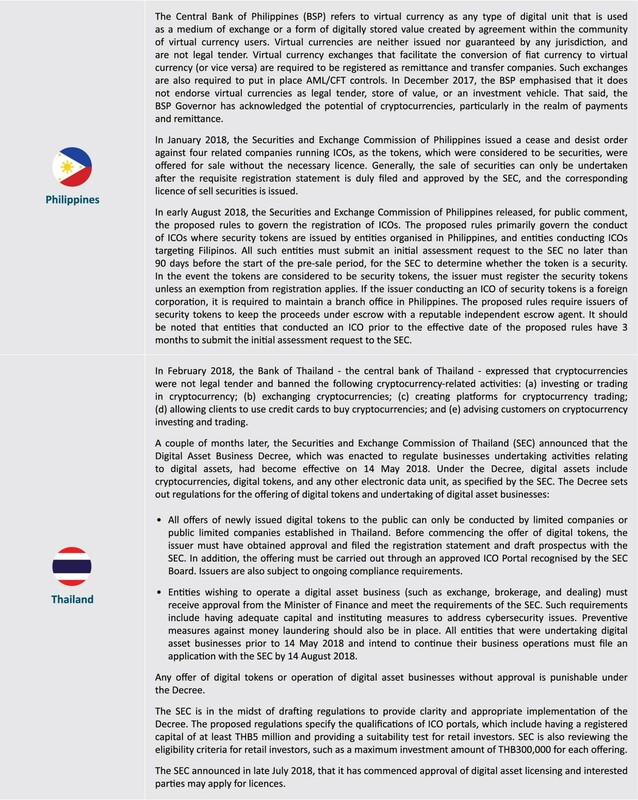 Given that the popularity of ICOs show little signs of abating, we anticipate that regulators in ASEAN will continue to monitor the developments and gradually provide greater guidance on the regulatory treatment of this new form of capital-raising, whether through specific laws, guidelines, or otherwise. 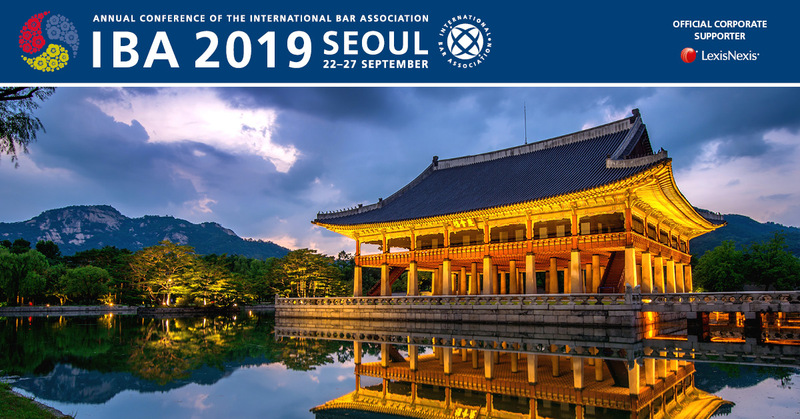 Issuers should remain cautious of the varying regulatory attitudes and legal pitfalls that exist in countries where it desires to undertake an ICO, particularly if the tokens issued are not intended to be securities. 4 Excludes Laos as there is limited information on the regulatory environment regarding cryptocurrencies, exchanges, and ICOs. Lian Seng has had more than 22 years of professional experience. His practice encompasses mergers and acquisition (including schemes of arrangements, takeovers, competitive sale processes and acquisition and disposal of shares and assets), corporate finance, and restructuring work. Lian Seng is recognised for his strong deal-making skills and has demonstrated client skills and technical ability on a number of major transactions in Singapore. Lian Seng has been involved in probably the highest number of successful reverse takeover transactions in Singapore. He has also successfully pioneered other transaction structures to achieve similar outcomes in the Singapore market. Lian Seng was named a Leading Lawyer in the Capital Markets and Corporate Finance areas in publications such as AsiaLaw Leading Lawyers and was a lead counsel in the restructuring of China Aviation Oil (Singapore) Corporation Limited which won the “Singapore Restructuring Deal of the Year” award at the Asian Legal Business Awards. Jun Meng advises clients in a wide variety of international cross-border mergers and acquisitions, capital markets, corporate, and commercial transactions. His experience includes reverse takeover transactions, corporate finance matters, joint ventures and pre-IPO private equity investments. Jun Meng, who is fluent in Mandarin, also advises on corporate governance and compliance matters. This article is updated as at 15 August 2018. The information in this article is for general information only and is not a substitute for legal advice. 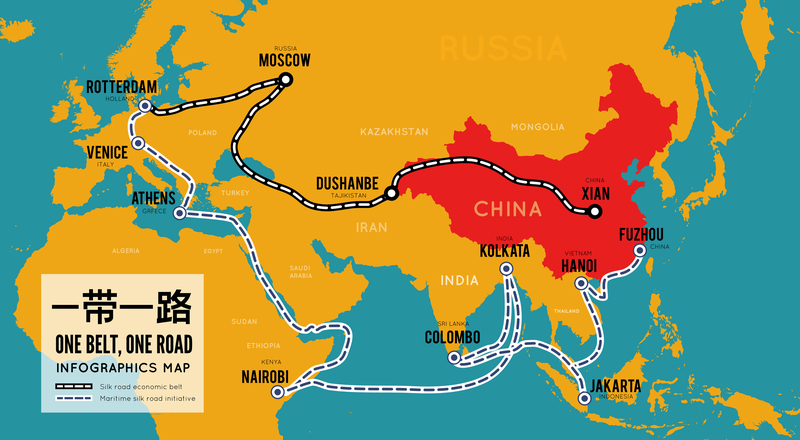 If you require any advice or further information, please contact us at contact@zico.group. Yap Lian Seng has had more than 22 years of professional experience. His practice encompasses mergers and acquisition (including schemes of arrangements, takeovers, competitive sale processes and acquisition/disposal of shares and assets), corporate finance, and restructuring work. Lian Seng is recognised for his strong deal-making skills and has demonstrated client skills and technical ability on a number of major transactions in Singapore. In terms of Reverse-Takeovers, Lian Seng has been involved in probably the highest number of successful RTOs in Singapore. He has also successfully pioneered other transaction structures to achieve similar outcomes in the Singapore market. 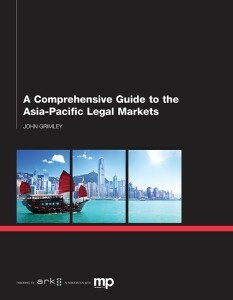 Lian Seng was named a Leading Lawyer in the Capital markets and Corporate Finance areas in publications such as AsiaLaw Leading Lawyers and was a lead counsel in the restructuring of China Aviation Oil (Singapore) Corporation Limited which won the “Singapore Restructuring Deal of the Year” award at the Asian Legal Business Awards.